A prototype application for an online coastal zone management module has been described that consists of three main components - the web-based interface, the mobile access interface and the adaptation mechanism that is used to provide just-in-time tailored content according to students’ individual preferences. From a pedagogical perspective, this implies a complete re-engineering of courseware in CZM to meet the constraints imposed by an m-learning environment. Alteration of any of the component would cause an ecological imbalance in the system and the blending of the pedagogical approach in CZM to support mobile learners adds more flexibility to the learning process. 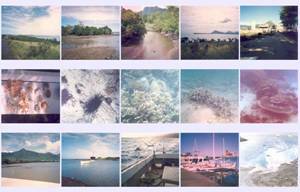 Keywords: e-mobile learning; asynchronous forums; coastal zone management. One of the main reasons behind the justification of universities going for distance education courses was the democratization of access to education to people residing in poor/excluded regions of the world. When e-learning was introduced, the same reason was used as one of the main driving forces in the justification process. One significant attribute of the technologies used in current educational enterprises is their capacity for real time interactivity. Well designed instruction is more likely to bring about a desired change in human learning and performance than is technology, regardless of the types of technology used. Computer-mediated conferencing (CMC) is also unique among distance education media because of its ability to support high levels of responsive, intelligent interaction between and among faculty and students while simultaneously providing high levels of freedom of time and place to engage in this interactivity (Rourke et al. 1999). Instructional interactivity is active learner participation in the instructional process and gives the learner some control over the pace and sequence of the instruction. Regardless of the signals being used, information needs to be transmitted interactively between the source and the destination between teacher and students, students and students or, between information to be learned and the students (Wagner, 1994). The availability of advanced mobile technologies, such as high bandwidth infrastructure, wireless technologies, and handheld devices, has started to extend e-learning towards mobile learning (m-learning) (Sharples, 2000). Successful interaction in the mediated educational transaction is highly dependent upon how comfortable the learner feels in working with the delivery medium. As technology increasingly becomes the means of communication between learner-teacher, learner-learner, and learner-content, the design of these mediating technologies becomes correspondingly important. The inability to achieve learner-interface interaction successfully can be a significant problem to those comfortable with technology yet unfamiliar with the specific communication protocols. Successful learner-interface interaction requires the learner to operate from a paradigm that includes understanding not only the procedures of working with the interface, but also the reasons why these procedures obtain results. In Europe, mobile phone technologies and use are much more widespread thus making the mobile phone a useful avenue to be explored to support technology-enhanced education practices and engage young people at risk of social exclusion to engage in learning activities and change their attitudes to learning thereby contributing to improving their skills, opportunities and lives. For example, simple short message service (SMS) to alert and remind the student that submission date for a given assignment is approaching can help the student better manage and organize his learning activities to meet the deadlines. Kinshuk and Lin (2004) explored how to improve learning process by adapting course content presentation to student learning styles in multi-platform environments such as PC and PDA. The online forum used in the Coastal Zone Management (CZM) module provided a very good collaborative environment for multiple interactions (tutor-students and students-students) unlike traditional classroom settings. 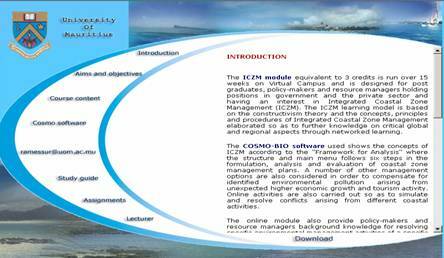 The online coastal zone management CZM module at the University of Mauritius has two forums at the disposal of the students -one for module content discussion and one which addresses technical issues concerning the module. The web site of the virtual platform i-learn was put at the disposal of the students for them to access the study guide and related information about the module, Figure 1. The highly interactive electronic teleconference media, especially personal computers and audioconference media, allow a more intensive, personal, individual and dynamic dialogue that can be achieved in using recorded medium and more effectively bridge the transactional distance. A photo gallery is consulted online and is linked to the various CZM topics as shown Figure 2. The module which is equivalent to 3 credits is assessed on continuous basis. Assessment is made on three topic assignments including an EIA case desk study. Students are able to interact with one another and their tutor in an asynchronous mode through forums on line on i-learn. Students participation on online CZM asynchronous forums is shown in Figure 3. The evaluation criteria is based on three main criteria - reading of messages, confirming peers opinions or adding value to any discussion threads. The two classes of users for CZM are web users and mobile users. The web user connects to the system traditionally on a desktop computer via their browsers and by using the HTTP protocol while the mobile user will likely be connecting with a smart phone or PDA device via a wireless network. On the server-side, the database contains information on courses, activities, exam question banks and student profiles that will be retrieved and used in the adaptation process. The lecturer uses the web interface to author assessment instruments that will be hosted by the University secure web server and also gets access to a range of tools such as monitoring students’ progress on the tests to determine the effectiveness of instruction. THE ADAPTATION PROCESS: A LEARNING STYLES APPROACH FOR CZM. The concept of 'adaptation’ is an important issue in research for learning systems and systems that allow the user to change certain system parameters and adapt their behavior accordingly are called adaptable. Systems that adapt to the users automatically based on the system’s assumptions about the user needs are called adaptive. Aptitude treatment interaction (ATI) research developed as a way to find the best methods of instruction for the student population. Peck (1983) stated that ATI is research correlating teaching methods with measures of student aptitudes finding that students may respond differently to a particular method depending on such variables as intelligence, learning style, or personality. The notion of flexibility and autonomy was encouraged with the CZM online module and created independence among distance learners. The main defining feature of online delivery was the separation of teacher and learner, usually in both time and space (Holmberg, 1989). This separation fostered noncontiguous communication (communication that occurred between the learner and teacher from a distance), which had to be mediated. Consequently, mediated communication became the second defining feature of e-learning. Mediated communication is an important feature in both e-learning and traditional distance education (McConnel, 1994). The separation of students and teachers in space and time involve two main systems for providing education at a distance. An asynchronous system where messages were pre-recorded in print or computer through online forums for use by learners at a different time from the time and/or place of recording was used during the CZM online module. E-learning of CZM was flexible and adaptable in that learners could study anywhere and anytime. If we have e-learning and web-enhanced learning such as the online CZM module, Marjanovic and Orlowska (2000) stress that the challenge here is not to re-create the face to face teaching situation with all its inherent problems with new technologies, but rather create new learning environments providing unique communication patterns, changed limitations to the types of learning activities that are possible and provide a new high quality learning experience. The autonomist model used for the CZM module mainly favours interaction between the student and his learning objects and has a tendency towards the constructivist approach. The autonomist approach seems to correlate well with the case of e-learning and web-enhanced learning where the importance of a new or better learning methodology is stressed. The academic model used during the CZM learning process seems to cater for this disadvantage since the simulation of a traditional environment is at the base of it while the autonomist model seems to cater for independence, flexibility and better learning methodology. The first component of the model most likely falls in the cognitive dimension allowed student to know better about the environment he will be operating in and other related information. The orientation session and the helpdesk support can be broadly categorized to the technical side of the model. The model tentatively consisted of two broad categories - technical and academic. An orientation session was important as a means of "climate setting" in order to introduce learners to the technology. The session which separates learning to use the delivery technology from the course content has several benefits: it does not compete with the course content, it helps ensure uniform minimal proficiency, and it removes the stress of graded performance (Hillman et al. 1994). The student can have a variety of options to take a test in CZM. The first option is that the student takes it online on a desktop computer. The next two options mentioned are currently under investigation - on synchronous mode through a portable device or offline mode where the student download the test application and synchronize performance afterwards with the server. Concerning the adaptation feature, when the students register in the system, they will be invited to take a learning style test that will help build a student profile in the system. Each question in the question bank is also rated with a 'learning style weight’ that categorizes the question according to the learning style in use. Networked learning during the CZM online module delivery at the University of Mauritius was interactive, flexible, promoting active engagement and social interaction and providing new opportunities for group working (Ramessur and Santally, 2003; Ramessur and Santally, 2005; Ramessur, 2006).The online forum used in the CZM module provided a very good collaborative environment for multiple interactions unlike traditional classroom settings. The difference was that through the forums, students took the lead and viewed the lecturer as a resource and a guide. The lecturer monitored the processes of group and collaborative work easier since the contribution of each student was made more obvious when they work online. The CZM online class consisted of 39 students but only 20 participated in the discussion forums. The tutor read the students’ postings, provided answers to queries, added pedagogical comments and provided advice. During the fifteen weeks that the asynchronous discussion forums were operational a total of 131 posts were made. Table 1 below shows the types of messages posted by the CZM students on the asynchronous forums. Interactions between the instructor and students and interactions among students with the CZM asynchronous online forum provided opportunities for an educational transaction. Without interaction, teaching becomes simply "passing on content as if it were dogmatic truth," and the cycle of knowledge acquisition-critical evaluation-knowledge validation is nonexistent. The use of new technologies during the CZM online delivery permitted live interaction and allowed for immediate feedback and interaction between teacher and student(s). Successful interaction in the mediated educational transaction was highly dependent upon how comfortable the learner felt in working with the delivery medium. The inability to achieve learner-interface interaction successfully can be a significant problem to those comfortable with technology yet unfamiliar with the specific communication protocols. Successful learner-interface interaction required the learner to operate from a paradigm that included understanding not only the procedures of working with the interface, but also the reasons why these procedures obtain results. An orientation session was important as a means of "climate setting" in order to introduce learners to the technology. The session which separates learning to use the delivery technology from the course content has several benefits: it does not compete with the course content, it helps ensure uniform minimal proficiency, and it removes the stress of graded performance (Hillman et al., 1994). Figure 4: Postings in CZM and CMCP (Computer Mediated Communications and Pedagogy) asynchronous discussion forums. The inability to achieve learner-interface interaction successfully can be a significant problem to those comfortable with technology yet unfamiliar with the specific communication protocols required to interact with the tools to accomplish a desired task. An evaluation criteria was devised based on three aspects of online forum participation - reading messages, replying (confirming or rejecting peer views) and adding value to the messages that obviously had higher weighting. This obviously resulted as a filter and students consequently made more effort to raise the level of quality of the messages they posted. Learning during of the CZM module occurred through the interaction of three core components: cognitive presence, teaching presence, and social presence. The development of cognitive presence was defined as the extent to which the participants in any particular configuration of a community of inquiry were able to construct meaning through sustained communication. Teaching presence included designing and managing learning sequences, providing subject matter expertise, and facilitating active learning. Social presence in the CZM module was defined as the ability of learners to project themselves socially and emotionally in a community of inquiry and supports cognitive objectives through its ability to instigate, sustain, and support critical thinking in a community of learners. As part of the quality assurance for the online courses, students were requested to complete an evaluation questionnaire of the online course and 85% students found that the online forums were a good learning experience and that they benefited from it. There were however some students who found the tool difficult to use. This is mainly a problem of computer proficiency. Many students pointed out the flexibility in the course as being a real advantage for them taking into account their normal semester load of work in class. Concerning access to the online module, 80 % of the students said they accessed the module frequently on campus while 60 % accessed the module frequently at home. In case the student does not perform as per expectations, that is achieves a score below the pass rate, or successively achieves a borderline score, then the system initiates the remediation phase where the student is given academic support and tutorials that are related to the content of the tests. The fact that students following online courses do not prefer to read pages of text online can be explained by two possibilities. The first possibility is that with the growing familiarity of students with the Internet and mobile devices, there could have been a paradigm shift and perceptions have evolved. The second possibility is that students are much more at ease with such devices (mobile phones and PDAs) that these tasks seem so basic and appealing (fashionable) to them (Santally et al., 2006). It is also clear that, for the student, the teacher/lecturer still has a very vital role in supporting the learning process in CZM. Most students have designated SMS/email messages as very important for approaching deadlines of assignments, class scheduling and whenever the lecturer posts something online. The student community is also widely accustomed to these SMS messages. It is obvious that they would welcome such initiative. There is also the argument that the evolution of mobile devices and 3G networks can bring about a revolution in the learning environment in that students can attend 'live’ lectures even when they are on the move. This argument is not a new one as similar claims were made for video-conferencing on the Internet. Videoconferencing is still highly inaccessible because of the cost of telecommunications involved in the process, while with the limited Internet bandwidth available in mainly developing countries and with reference to Mauritius, videoconferencing is still not a widely used feature. The implied costs for 3G services are still too high for the wide adoption of this technology among the student population and ultimately the educational system in Mauritius. The problem that exists with the emergent technologies nowadays is that it seems imperative that there is a feeling that it is compelling to integrate every new technology in the teaching and learning process. It is not because a chat facility exists in a learning platform that it should be included in every activity or pedagogical scenario and that a face-to-face session should be excluded solely because the new technology of chat or 3G helps bypassing a classic conversation. It is therefore obvious that emphasizing on the flexibility brought about by the new technology can become a means to redynamize the CZM teaching and learning process through the provision of a permanent communication and coordination link for the student with his/her learning environment. This aspect can be seen as an enhancement to the learning support process. A constraint that has been highlighted by some of the respondents relates to the relatively small screens of such devices that take the problem in another dimension. The size of the screen definitely affects the usability aspect, the range of features that can be supported, the organization of the navigational structure and the pedagogical approaches that can be adopted. Although from the study, it seems learners are not against downloading and reading documents on their mobile devices. From a pedagogical perspective, this implies a complete re-engineering of courseware in CZM to meet the constraints imposed by an m-learning environment. In any virtual learning environment the concepts of usability, pedagogy and technology form a balanced triad. Alteration of any of the component in the detriment of another would cause an ecological imbalance in the system. For instance, focusing too much on a complicated pedagogical approach may decrease the usability of the system, as the m-learning environment will possibly contain highly unlinear navigation structure. We acknowledge data analysis carried out by S Ah Fock, CZM students for their input in the forums and technical assistance from the VCILT. Burge, L (1995). Electronic Highway or weaving loom? Thinking about conferencing technologies for learning. Research and Development in Open and Distance Learning, Routledge. Clark, R.E (1994). Media will never influence learning. Educational Technology Research and Development. Vol 42 no. 2 pp 21-29. Conrad, D. (2002). Deep in the Hearts of learners: insight into the nature of online community. Journal of Distance Education Vol 17 No. 1 pp 1-19. Cunningham, 1987, 1992; Language Development & Hyper media Group, 1992a, 1992b; cf. Bruner in chapter 7. Goodyear, P. (2000). Effective networked learning in Higher Education Project. JISC/CALT. Hillman, D.C.A., Willis, D. J. and Gunawardena C. N. (1994). Leraner-interface interaction in distance education. The American Journal of Distance Eduction. Vol 8 No. 2 pp 30-42. Jonassen, D.H., Campbell, J.P. and Davidson, M.E. (1994). Learning with media: Restructuring the debate. Educational Technology Research and Development. Vol 42 no. 2 pp 31-39. Kinshuk and Lin T. (2004). Application of learning styles adaptivity in mobile learning environments. Third Pan Commonwealth Forum on Open Learning, 4-8 July 2004, Dunedin, New Zealand. Kozma, R.B. (1994). Will media influence Learning? Reframing the debate. Educational Technology Research and Development. Vol 42 No. 2 pp 7-19. McConnel, D (1994). Implementing computer supported cooperative learning,Kogan Page, London. Moore, M.G. (1993). Theory of transactional distance. Theoretical Principles of Distance Education. Routledge pp 22-38. Peck, M.L. (1983). Aptitude treatment interaction research has educational value. Proceedings of selected research paper presentations at the 1983 convention of the Association for Educational Communications and Technology and sponsored by the Research and Theory Division. New Orleans: Association for Educational Communications and Technology pp. 564-622. Ramessur, R.T. and Santally, M.I. (2003). Design and online mode delivery of a coastal zone management module using a constructivist approach. ICOOL Proceedings. Ramessur R.T.and Santally, M.I. (2005). Asynchronous Computer Mediated Conferencing for an Online ICZM Module. ICOOL Proceedings. WCCE 2005. Ramessur, R.T (2006). Pedagogical aspects of Computer Mediated Conferencing for an Online ICZM Module. Arpege Symposium Proceedings. Richard, F., Matthews, R., Sommer, B. and Accredolo C. (2000). Evaluating online learning on campus.IEEE. Rourke, L., Anderson, T., Garrison, D.R., and Archer, W.(1999). Assessing social presence in asynchronous text-based computer conferencing. J. of Distance Education pp 50-71. Santally, M.I., Hossany,M. and Ramsahok, G. (2006). A m-e adaptive architecture to support flexible learning. Malaysian online journal of instructional technology. Vol 3 no.1 pp 19-28. Scura, L. F., Chua, T.E. and Paw, J.N. (1992). Lessons for Integrated Coastal Zone management; The Asean Experience. pp 1-70. In: Chua T. E and Scura F. L (1992). Integrative Framework and methods for coastal area management. ICLARM Conference proc.37, 169 pp. Sharples, M. (2000). The design of personal mobile technologies for lifelong learning, Computers and Education. 34, 177-193. Wagner, E.D. (1994). In support of a functional definition of interaction. The American Journal of Distance Education. Vol 8 No. 2 pp 6-29.